Our Diocese began an initiative in 2015 entitled ‘Live, Pray, Serve’. Through the bible readings and teaching we receive at church, in our home groups and in our personal reading we are learning to grow and live as disciples of Christ: growing in faith, responding to God’s call, bearing witness to the gospel, and connecting our faith with everything else that goes on around us locally, nationally and globally. We pray, individually and together for our own church and our contribution to life in our Parish as well as the work of the Church throughout the world. We serve, with Jesus as our example. We try to demonstrate his love and seek his justice and peace. 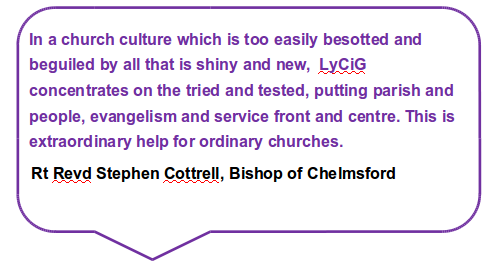 An important strand of ‘Live, Pray, Serve’ is church growth which aims to build on the work of previous initiatives such as Kairos in 2004 and Ministry for Mission in 2012/13. 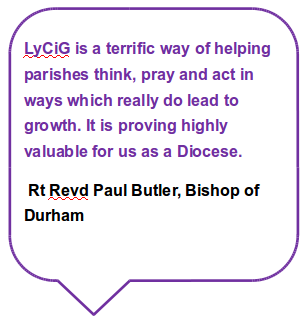 ‘Leading your Church into Growth’ (LyCiG) is a nationally run course that was offered to Parishes in the Diocese, including Titchfield, in October 2016. 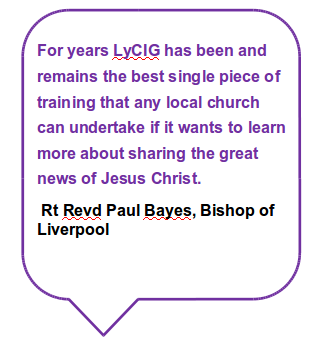 To spread the opportunity further, the Diocese purchased LyCiG local material for all Parishes to share with their own congregations. All of us at St Peter’s are invited to attend these sessions which will include extracts from a DVD, group opportunities for discussion and Bible study and reflective sessions. Three dates will be offered in the new year. It is an opportunity for us all to share, listen and talk together – please join in. Everyone is welcome.